So, my wife and I kick off the vacation of our lives this morning, winging our way first to Chicago, then on to Paris for a quick layover before our final leg to Istanbul, Turkey. Yeah, pretty amazing, huh? Little ol’ me in Turkey. And we’re not stopping there. You see, it’s like this in a nutshell: My parents bought a small hotel in the Caribbean in 1973, then they divorced and both remarried outstandingly cool people, my dad’s wife Angela being Welsh, and they sold the hotel and my dad bought a place in north central England (Lincolnshire) and they started splitting their time between the Turks & Caicos and England, but then they began vacationing with a sorta timeshare deal and hit on this place in southwest Turkey that they fell in love with and a few years later decided to buy a small place and refurb it, and so now they tri-split their time between the three spots, and this year is my dad’s 80th birthday, so he invited us to join him there to celebrate. Got it? But first Nancy and I will hang out in Istanbul for a few days, then fly down to Dalamar where we’ll drive around to Amos, where my dad lives, which is right next to Turunç. We’ll get there on Monday and then my brother Eric and his wife and daughter will arrive on Wednesday from Bangalore, India, where he works for Boeing. 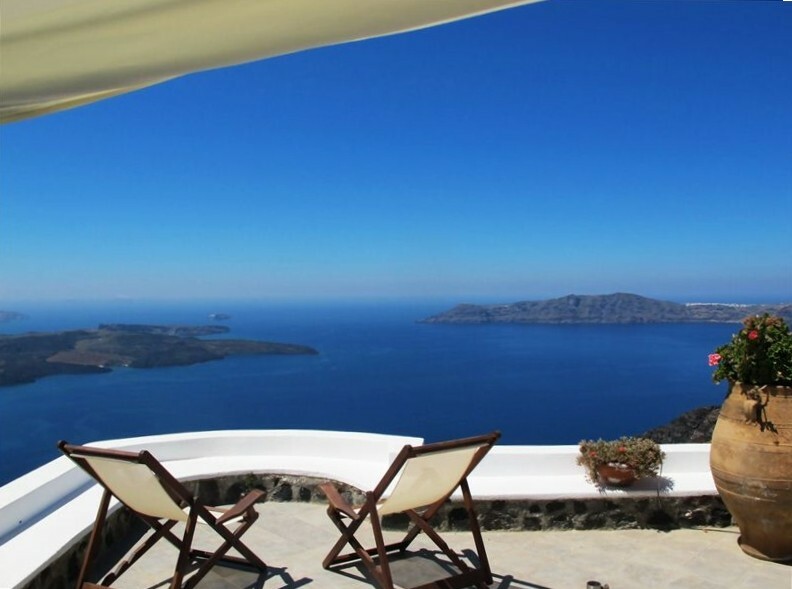 On Friday we’ll leave them and ferry to Rodos, where we’ll catch a plane to Athens, then on to the Greek isle of Santorini for a week of unfathomable bliss. We decided to take our first shot at VRBO — Vacation Rental By Owner — and I think we scored big time. Here’s a photo of our balcony. Seriously, that’s our exact balcony. The place is called Mi Amo, you can look it up. We’ll then finish the trip with one night in Paris, France — we arrive at 2:30pm and depart for home at 10:30am the next day. A single night in Paris. Sounds like a movie or something. See, like I said, a trip of a lifetime. At least my life time so far. And if you’d like to tag along on the journey, I’m going to do my best to post something every couple of days. Some photos and anecdotes. Should be fun. Though I’m not bringing my laptop, just my iPad, and WordPress doesn’t work so well on that little unit. I may need to steal away to an Internet cafe here or there to do my thing. We’ll see how it goes. Oh, and if you want to take a look, I just launched a new website which will be the hub for all my work as a writer/author. It’s pretty simple: www.authorglenngordon.com Still not exactly what I want, but it’s getting there.